Since the founding of our company in 1967, we’ve made a concerted effort to continuously improve our processes and take care of our customers. In 2004, we implemented Lean Manufacturing as a further method to bring our service and support to a higher level. Lean Manufacturing is a common sense approach to an organized and systematic program for continuous improvement. How Do We Use Lean Manufacturing? By dedicating personnel and time toward removing waste, reducing through-put time and simplifying our overall processes we make improvements throughout the entire company—from processing your order, manufacturing on the production floor, to delivering your product to dock—we strive to remove all wasteful activities. Sort – Using small batches of work allows us to properly organize, to increase overall efficiency. Set to order – We make sure each project is organized in a manner where the material needed is always in stock and easy to locate. Shine – We keep our work areas clean to help foster a more effective safe, and productive work environment. Standardize – When a manufacturing process is designed and validated, we make it standard procedure. Sustain – We put systems in place to sustain the positive changes we’ve made. Safety – Ensure our processes prioritize the safety of our employees. Kaizen Event – A small group event—for owners, operators, and outsiders of a process—to make improvements to that process. Kan-ban System – A Kan-ban System allows us to use Just-In-Time (J.I.T) Production and Ordering Systems to minimize inventories while still satisfying customer demands. Takt Time – Creating a constant pulse across our processes—highlighting capacity, synchronization and quality issues—the Takt Time approach allows us to streamline operations and deliver the right product, at the right time, in the right quantity to our customers. 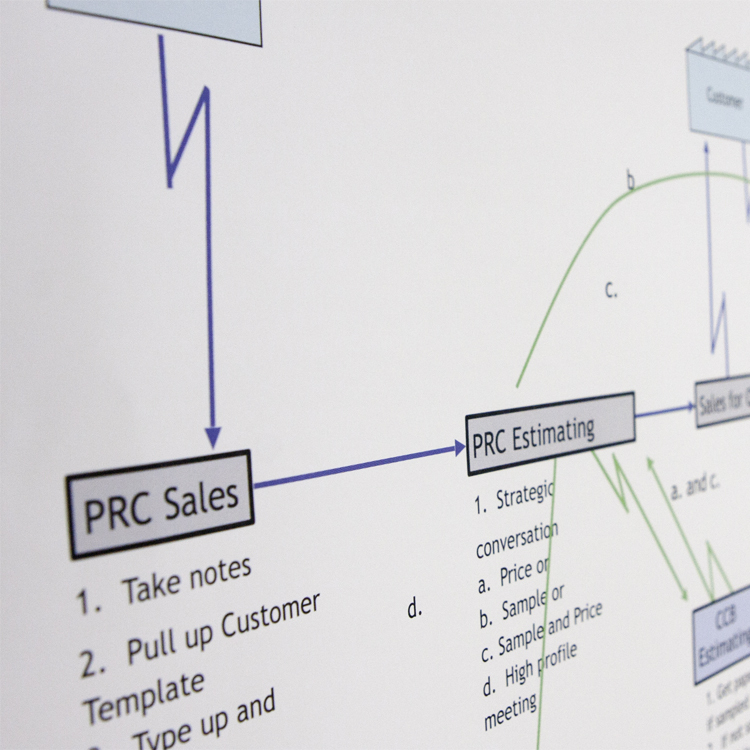 Value Stream Mapping – A tool that allows us to achieve true J.I.T. manufacturing—We eliminate production waste by taking out unnecessary labor, handling, and storage throughout the manufacturing process. Workflow Analysis – Provides us with insights to improve efficiency and productivity. Our company-wide culture encourages everyone to reach out to our Lean facilitators to help implement additional efficiency improvements. We are always working to get better while increasing our flexibility and response to our customers ever changing needs.